When you install battery storage along with your solar panel system, you can store excess solar electricity produced by your panels for use later on when the sun goes down, when your panels aren't producing power. Solar batteries provide many benefits for property owners, including increased savings and disaster resiliency. If your electric utility uses a time-of-use (TOU) rate structure or demand charges, having solar battery backup can save you money on your electric bill. Additionally, in areas without a true one-to-one net metering policy, solar batteries will also save money on your bill. Aside from saving money on your electric bill, solar batteries can provide backup power in the case of a grid blackout. If the power goes out and you have solar electricity stored in a home battery, you can power your home for a period of time using the electricity you generated with your solar panels. The traditional method of powering a home during a blackout is by running a standard diesel generator that costs extra money to fuel and maintain and produces greenhouse gas emissions. Are you considering installing a battery with your solar energy system? With EnergySage’s solar battery guide, you can determine whether a solar-plus-storage system make sense for your home and find the battery that meets your needs. Can you go off-grid with solar batteries? Many homeowners who are shopping for solar on the EnergySage Solar Marketplace want to use their solar panels to go “off the grid.” Is it possible to go off-grid with a solar panel system that includes a battery? 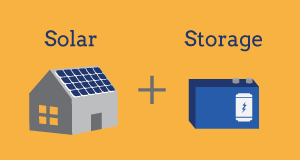 Learn more about what it takes to go off the grid with solar-plus-storage. Battery technology has been around for decades, but solar batteries are new to the market. Before you make a purchase, understand how solar batteries work, and when they’re the right option for your home energy system. Use EnergySage's comprehensive resources to find the solar battery that is best for your home or business's solar-plus-storage needs. When should you install a solar battery? Whether you’re considering a standard solar energy system or one that includes energy storage, you can receive multiple offers from qualified, pre-screened solar installers in your area on the EnergySage Solar Marketplace. With EnergySage, high-quality solar installers compete for your business, which means you can save 20 percent or more. When you register, specify that you’re interested in a solar-plus-storage option to receive offers that include solar batteries. FAQ: Can solar batteries power your house? Yes, solar batteries can be used to power your house. However, a single solar battery will only power your home for a few hours. In most cases, it makes sense to stay connected to the electric grid even if you have a solar-plus-storage system.